Why do gels need to be stained after electrophoresis? DNA, RNA, and proteins are colorless in solution. Nucleic acid and protein stains allow us to see the individual bands created by electrophoresis. What types of DNA stains are used in the laboratory? Research laboratories commonly use fluorescent DNA stains because they are extremely sensitive, making it easy to detect small amounts of DNA. However, an ultraviolet (UV) light source must be used to visualize the DNA fragments. Although visible dye-based DNA stains are less sensitive than fluorescent stains, they are an excellent alternative for the teaching classroom because they are non-toxic. The dye molecules stain the DNA fragments a bright blue color, so special equipment is not required to detect the DNA. Edvotek ® offers several different methods for visualizing the DNA separated by electrophoresis. 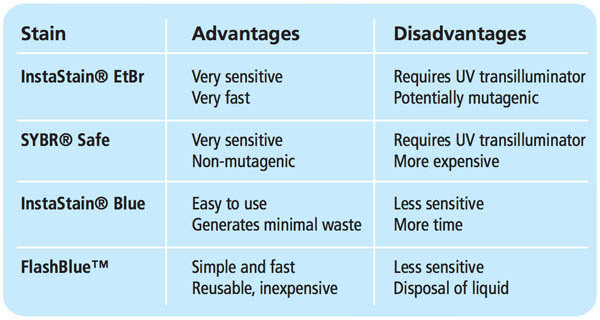 The table (right) outlines the advantages and disadvantages for each DNA stain. •	The easiest and most convenient visible dye-based DNA stain available is InstaStain® Blue. InstaStain® Blue does not require the formulation, storage and disposal of large volumes of liquid stain. Each InstaStain® Blue card contains a small amount of blue DNA stain that is used to visualize the DNA. 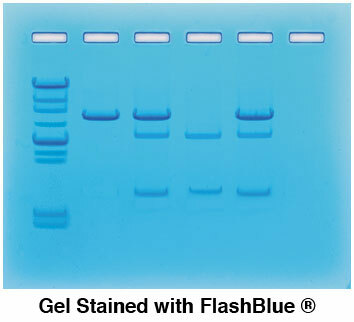 •	FlashBlue™ is a visible dye-based DNA stain that offers simple and rapid staining of agarose gels. FlashBlue™ is provided as a concentrated liquid stain that, when diluted, can be used for both rapid and overnight staining of DNA fragments. •	The most commonly used fluorescent DNA stain is Ethidium Bromide (EtBr). This molecule binds with the DNA in the gel. When excited with UV light, the EtBr fluoresces and produces a bright orange light. However, because EtBr is a potential mutagen, it must be handled with care. 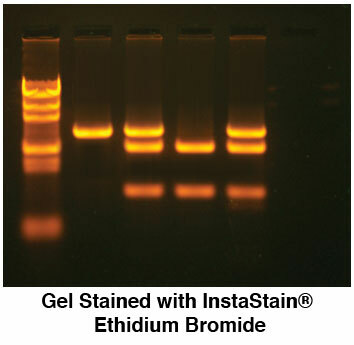 InstaStain® Ethidium Bromide provides the sensitivity of EtBr while minimizing potential contact with hazardous materials by delivering a small amount of stain to the agarose gel via a special paper backing. •	SYBR Safe® is a DNA stain that fluoresces with a bright green color when excited with UV light, similarly to EtBr. Unlike EtBr, SYBR Safe® has been engineered to be less mutagenic, making it much safer to use in the classroom. How do I use these DNA stains? Check out our instructional videos at youtube.com/EdvotekInc, or download our Quick Guide to Visualizing DNA for detailed protocols. I want to start doing electrophoresis in my classroom. What do I need to get started? Luckily, all of this equipment is included in our Classroom DNA Electrophoresis LabStation™. This set-up will support up to 24 students. As an added bonus, this LabStation™ includes all of the reagents you need to perform your first DNA fingerprinting experiment – the DNA samples, the electrophoresis buffer, the agarose, and the DNA stains. Furthermore, we redesigned all of our electrophoresis units to better meet your classroom needs. Our sleek new electrophoresis chamber introduces the following features while maintaining your favorite features from the M36 Classic. 1. Innovative design holds six gels in one chamber. This means your entire class can perform electrophoresis in one chamber, saving money and space! 2. Want to view the gel while it’s running? This can be difficult because the lid will fog up during electrophoresis. Our contoured lid and increased venting reduces condensation, making it easier to view the gel. 3. Large, color-coded push tabs makes lid removal simple. 4. The redesigned leads leave the lid at a 90° angle, conveniently tucking them out of the way. 5. Removable, replaceable electrodes make it easy to repair the equipment in the comfort of your classroom. 6. The molded pour spout helps with post lab cleanup – no more spilling electrophoresis buffer! We hope this helps you get excited about performing electrophoresis in your classroom! Have any other questions about electrophoresis? Please call EDVOTEK’s Technical Support at 1.800.338.6835, available Monday-Friday 8:00am -5pm. We’re happy to help!